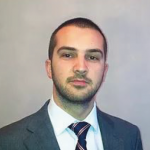 Laurentiu Gorun is a partner at Drakopoulos Law Firm Romania. With extensive experience in International Trade law, Laurentiu regularly advises major local and international conglomerates with respect to their day to day activities and large scale projects. Dr. Gorun is also a leading mediator, one of the first accredited in Romania, and is recognized by the most renowned international directories such as Legal 500.